Dubai, UAE, June 4, 2018: With Ramadan well underway, it is time to start thinking about what to gift your loved ones this Eid-Al-Fitr. Giving gifts this blessed festive season is the perfect way of expressing your love, gratitude and respect, and with the launch of the HydroPeptide’s On the Bright Track travel kit, your search for the ultimate Eid gift is covered. Cleansing Gel: It helps in removing dirt and excess oil while toning and lifting away all traces of make-up without over-drying. It has three properties of cleansing, toning and removing make-up. This unisex Cleanser is perfect for both female and male skins. 5x Power Peel: A 5 day supply of daily resurfacing pads. They help to brighten and smooth away the appliance of wrinkles with 5 daily exfoliators. It helps to promote healthy cell renewal and enhances skin clarity. Gentle enough for sensitive skins. LumaPro-C - This intelligent serum acts as a pigment corrector and helps to brighten the skin. Clinically proven to brighten, improve radiance and fade pigmentation with the advanced peptide ingredients. It prevents excess pigmentation from accumulating in the future by blocking key factors that cause uneven complexion. (Hydroquinone Free) . HydroPeptide Nimni™ Cream is a first-of-its kind patented collagen support complex that rejuvenates skin at the epigenetic level. This groundbreaking technology significantly improves the appearance of skin’s fullness and elasticity from the inside out. It works by turning on your body’s collagen-producing genes and feeding cells the physical materials needed for collagen synthesis. It is the only formula able to use this patent, and signals a new wave of wellness driven by geneticists. Apply Nimni at night directly after applying your serum of choice and prior to applying your moisturizer. Solar Defense Non-Tinted - Broad Spectrum SPF 30, helps to protect the skin from UVA, UVB and infrared damage while delivering a flawless finish to your skin. It allows to camouflage minor imperfections while promoting a clear complexion while also replenishing hydration without feeling heavy. 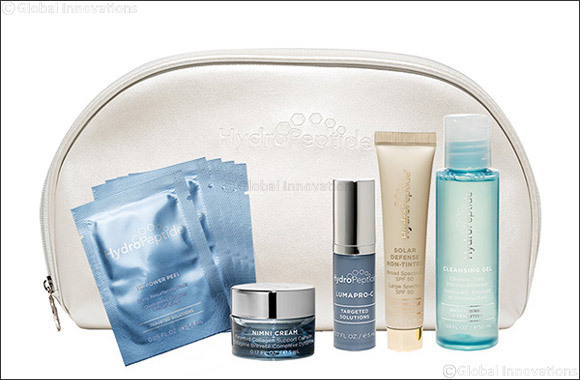 The HydroPeptide’s On the bright track travel pack is priced at 395 AED and is available at a number of locations across the UAE including Tao Spa Dubai, Jam Beauty Lounge Dubai, His and her salon JLT, The Spa Radisson Blu Yas Island Abu Dhabi and Rossanno Ferretti Hair Spa in Abu Dhabi.